Welcome to a new opportunity to distinguish yourself from your competition! Your customers appreciate estate and antique jewelry, and The Singer Collection gives you the opportunity to make those sales. 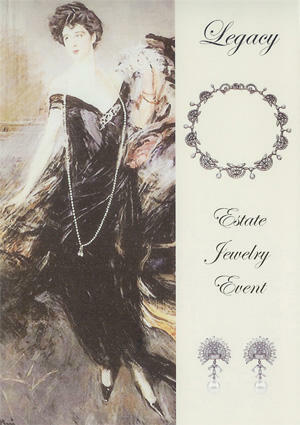 This event tells your customers you care enough to bring them rare estate and antique jewelry. With hundreds of pieces priced from $500 to over $50,000, our collection will span at least 25 feet of showcase with rings, bracelets, earrings, brooches, pendants, necklaces, and more. We travel the world to showcase treasures from every important period, including a vast array of precious and semi-precious gems, platinum and a wide selection of colors and karats of gold. Our collection is sprinkled with a dazzling array of celebrity pieces and/or very special delights from world famous jewelry houses. If this is your first event, the most important thing that you need to remember is that this amazing opportunity lasts just one day! It is up to you and your staff to make the most of this day – and we are here to help every step of the way. This manual contains invaluable information that has been gathered over the past 25-plus years of outstanding events. From mailers, posters and buttons to training materials and incentive programs, we supply everything that you will need. An Estate Jewelry Expert will be with the jewelry at all times to ensure that your event is flawless. Together with my staff we have 250-plus years of combined experience in this business. You can call us anytime for assistance. This event will require dedication and extra effort on your part - but the rewards can make it extremely worthwhile. In addition to the potential for one-day spectacular sales, long-term benefits include building your customer base, accessing our inventory year round to fill special requests and earning the reputation as an innovative provider of estate and antique jewelry. You provide sophisticated customers who can appreciate an event of this caliber, and we do the rest. Together, we can make this an event that you and your customers will never forget!